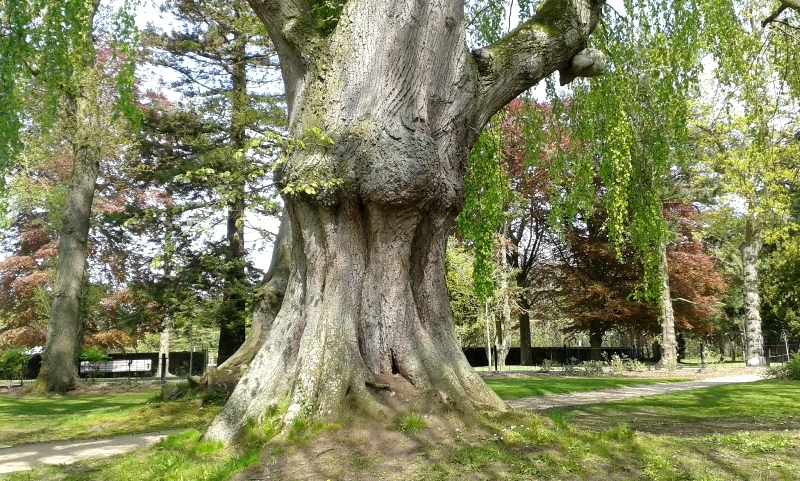 Some trees these days suffer middle age spread! 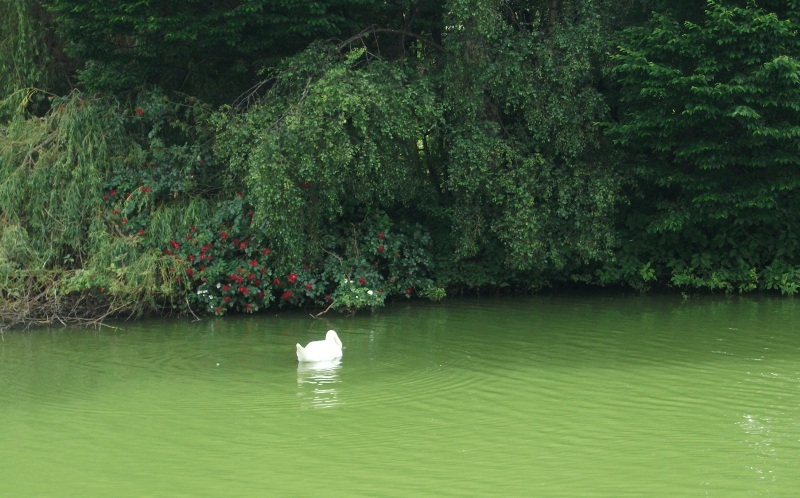 The photo was taken on a recent visit to Antrim Castle grounds. 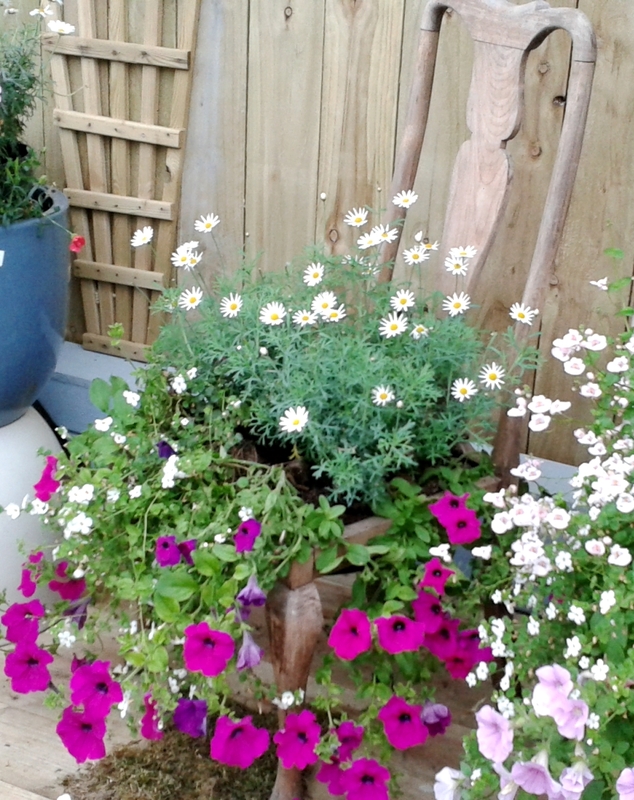 This entry was posted in Ireland, Photography on July 13, 2015 by Grannymar. This entry was posted in Photography and tagged Photography, Sunset on April 21, 2015 by Grannymar. It has been a long week. So long, it had two Saturdays, two Sundays and two Mondays. Alas, to day it comes to an end and I head for home. Saturday: We made Christmas puddings – You already know about that. Sunday: We had a visitor for morning coffee. After lunch the landlady walked the legs off me. We dandered to the Basin. 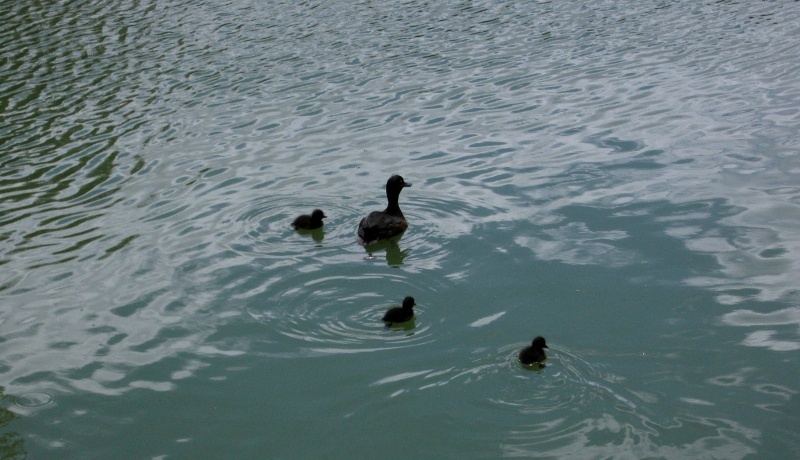 We watched a mammy duck teach her three tiny balls of fluff, no bigger than cotton balls, to swim. Their tiny legs were going a mile a minute under the surface of the water, until….. a large bird swooped down…. Then there were only two balls of fluff for the mammy duck to quack instructions at, to swim faster than time to the protection of their hidden nest on the island in the middle of the lake. When we left the basin, we passed the Black Church where legend has it that if you run around the church clockwise three times, then enter the church and stand by the altar, you will see the devil. I never quite had the courage to test that theory when I was young. The building was deconsecrated in 1962, and is now occupied as offices. 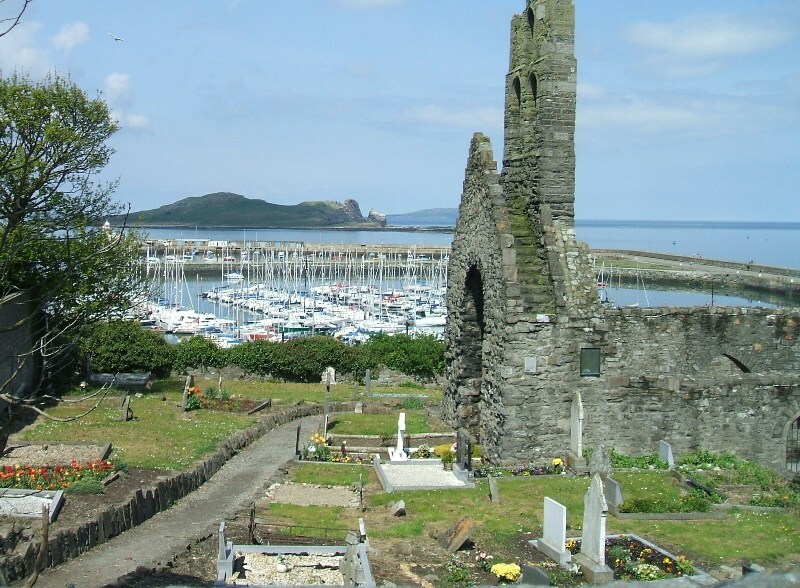 The Black Church is mentioned briefly in the novel Ulysses by Irish author James Joyce, in the chapter entitled ‘Oxen of the Sun’, as the location of one of Bello’s many sins: He went through a form of clandestine marriage with at least one woman in the shadow of the Black Church. Joyce lived for a few months only yards from the Church in Broadstone, at 44 Fontenoy Street, one of the Joyce family’s many temporary homes around Dublin. He stayed there with his son Giorgio from July to September 1909 and again alone from October 1909 to June 1910 while trying to set up the first cinema in Dublin. He even called me Nora! 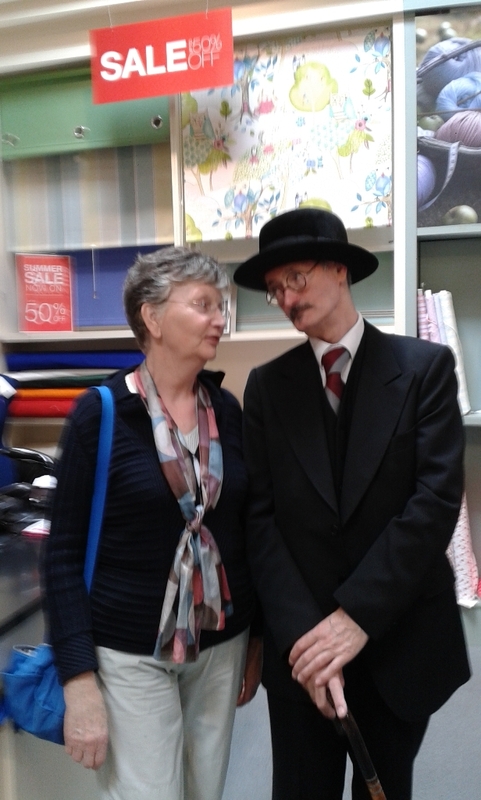 It was Bloomsday. 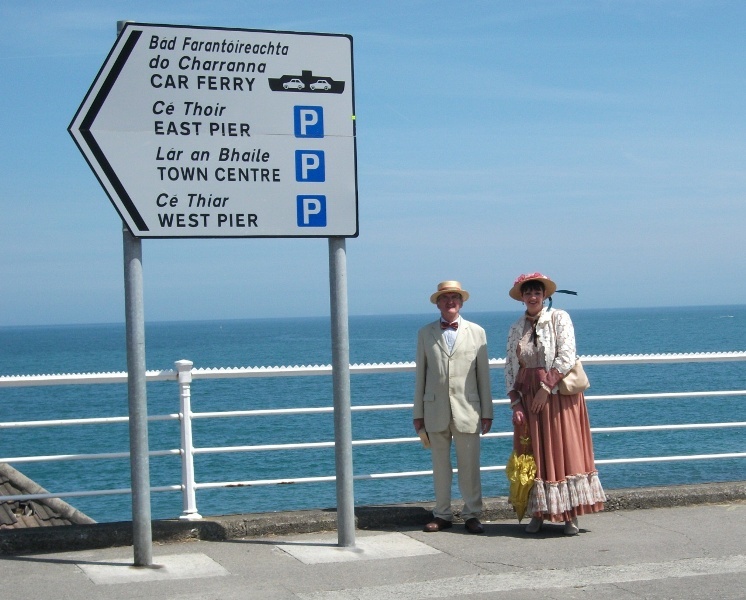 In Dublin, Joyceans in full Edwardian costume mark June 16th 1904 literary events of ‘Ulysses’ We met them on the Dart, on the Streets and in the shops. Eileen and I went to Dún Laoghaire. They were there ahead of us. I have to tell you what happened on the Dart. You will never believe it. Eileen, nudged me with her elbow and said “That guy over there winked at me!” I looked at the Toyboy and said, pointing at my sister “Did you wink at her?” He nodded. I looked questioningly and asked “Where’s my wink?” Grinning, he winked at me. Holding up my mobile phone, I asked if he wanted my number. He burst out laughing. With that, the engines started and we were moving…. Our Dart moved south, and his on the other track moved north! 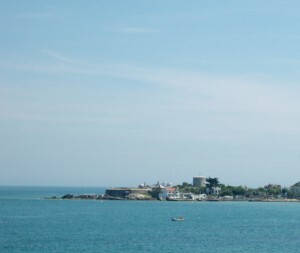 No visit to Dún Laoghaire is complete without a visit to Teddy’s for a 99 – a whipped ice cream cone with added flake chocolate. 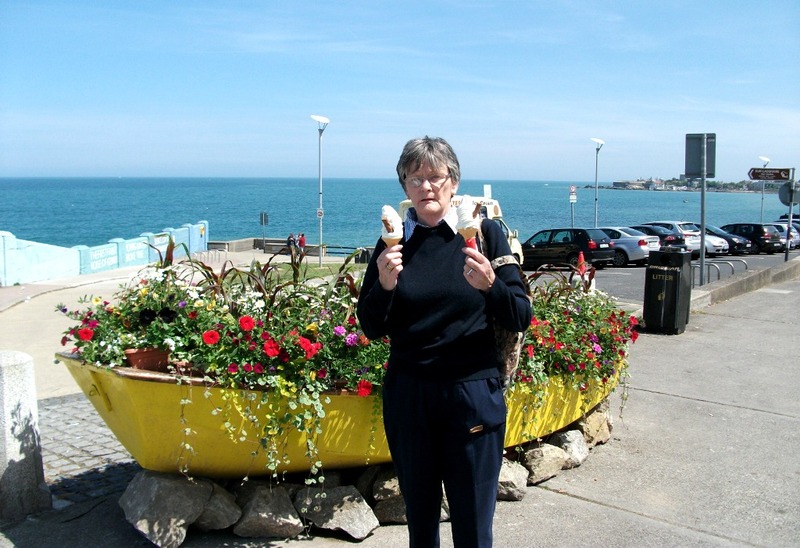 Eileen with ice cream cones. The view as we sat and enjoyed our treat. I suggest scrolling to the bottom of the link above and working upward to follow the work in progress. I found it fascinating. 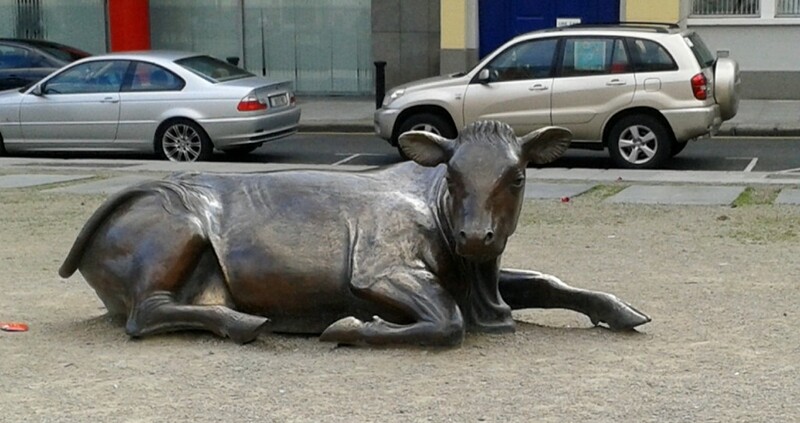 I am trying to image life in Dublin 1,000 plus years ago. 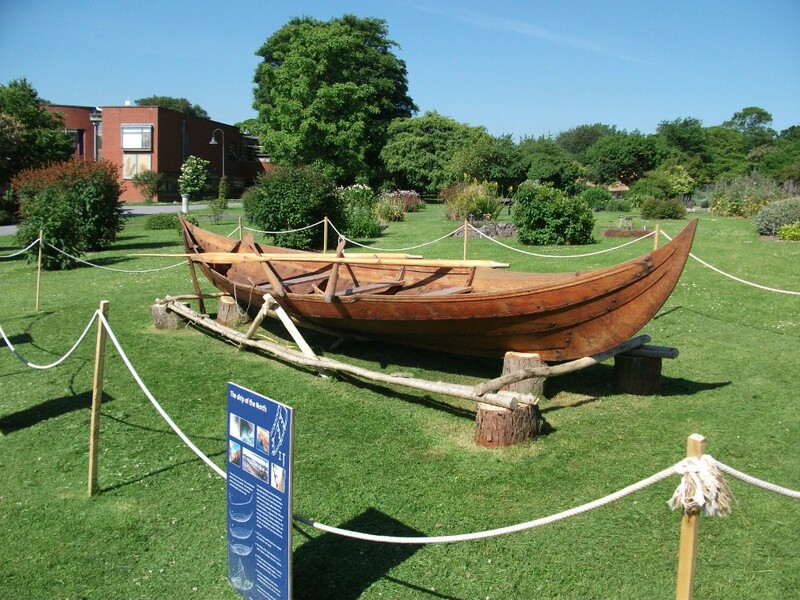 I also saw a replica Viking boat ‘Gro’ on display. It was constructed from Irish oak in 2006 at the Irish National Heritage Park by Danish boatwrights using techniques employed in Dublin 1,000 years ago, the boat is on loan from the Ferrycarrig Heritage Park. I drove my sister to Howth for an early dinner, which was delicious, and we were home in time to see one of the Football matches. Wednesday: We were entertained to lunch by Brian, who sent us each a text as we were leaving home to say, he had just realised it was forty years since we first met, so a good job we looked like we did all those years ago! Is it really forty years since I was given the handle Grannymar? Yes, it is. 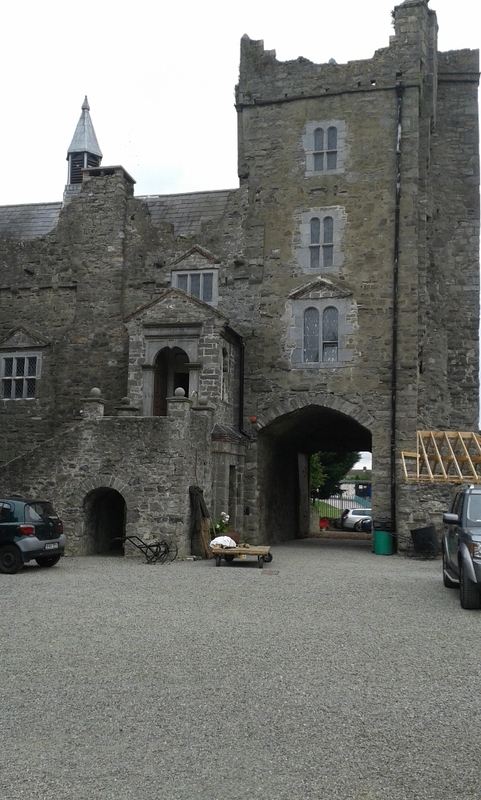 Thursday: I visited Drimnagh Castle, but that adventure is worth a special post. I hope to have it ready for Tuesday. Friday: was a rest day, playing with Buffy and finishing a project that I was working on. I forgot to take a photo of the finished item, so when I get that photo, I’ll write about it. and I found a very comfortable seat to rest my legs before we climbed the hill. I nearly got a job too! One old guy asked if I would plough his back field? I told him I was busy and it would have to be next week! Sunday: I went to work! Really. You have heard of ‘Bring your daughter to work days. Well this was a bring your family to work day, at Intel. Do you like my outfit? Grannymar in a Bunny suit! These are actual uniforms worn by those who work in the clean-rooms. 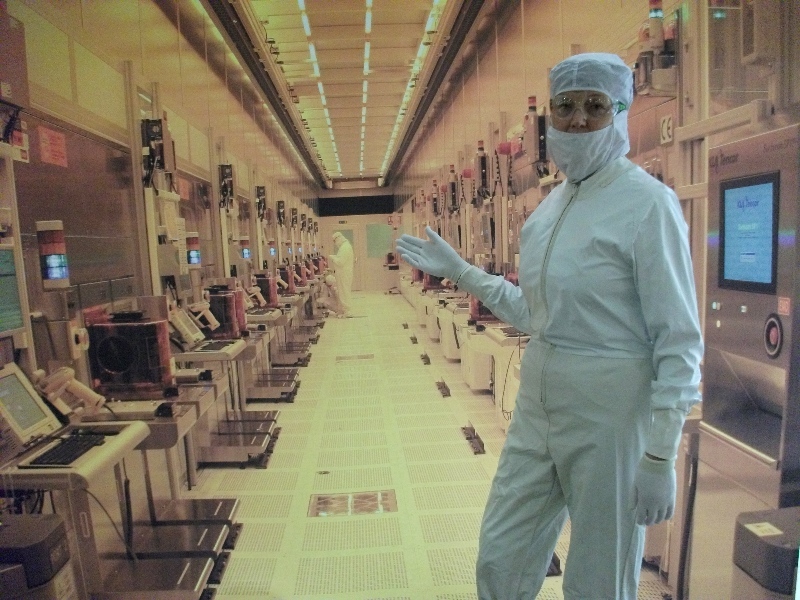 Buses took us on a tour of the site and we had a window tour of a clean-room. 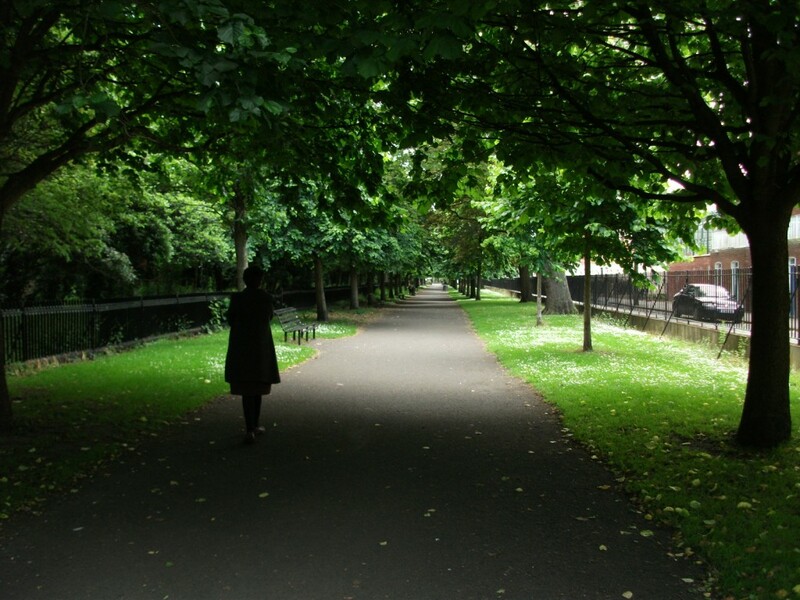 Elly showed the corridor she walks everyday, at least twice. It is a mile in each direction. We were introduced to the gym, where I could not miss an opportunity to sit on the equipment. I tested a massage chair, it felt like Ramana Rajgopaul’s masseuse was dancing on my back. 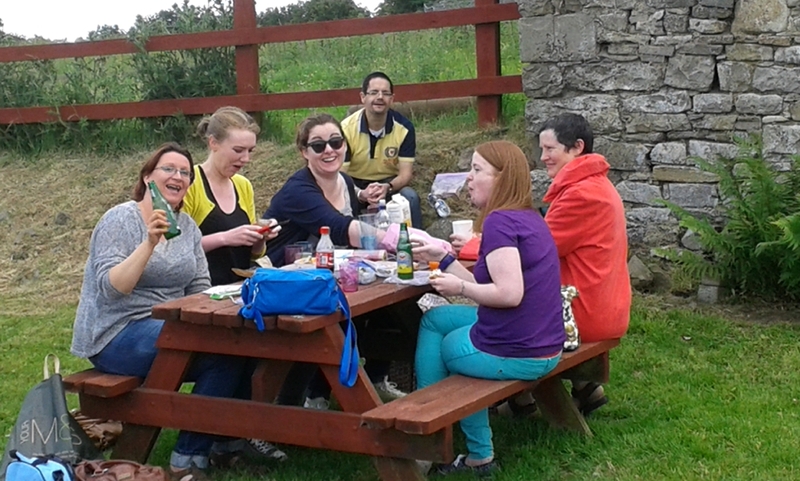 The staff looked after us royally and had fun & games for all ages. Thank you everyone for making us so welcome. Now the holiday has come to an end and I am homeward bound once more. I am covered in a healthy outdoor glow and my legs must be at least six inches shorter from all the walking. It was a wonderful week. 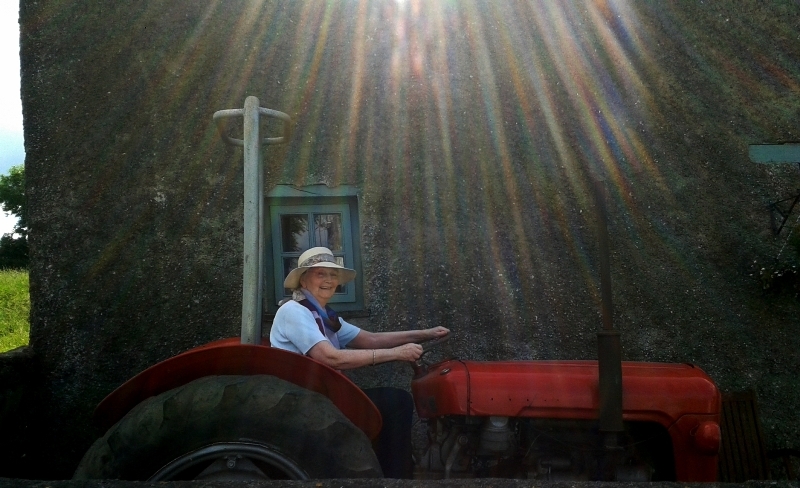 This entry was posted in Family, Friends, Fun, Ireland, Photography and tagged Family, Friends, Fun, Ireland, Travel on June 23, 2014 by Grannymar. Dashing away with a smoothing iron. On Saturday, in a light hearted short post, I admitted that I had been wrong to iron my clothes. The graphic I produced told me the freshly pressed clothes showed up the crease lines on my face. Immediately I was back in the house of my youth with a mountain of shirts, blouses, sheets, pillowcases, half a dozen linen tablecloths and napkins, tea towels and a mound of handkerchiefs….. I replied to Col, with: “I have evidence of one young lady who took that idea to the extreme! Watch out on Monday”. 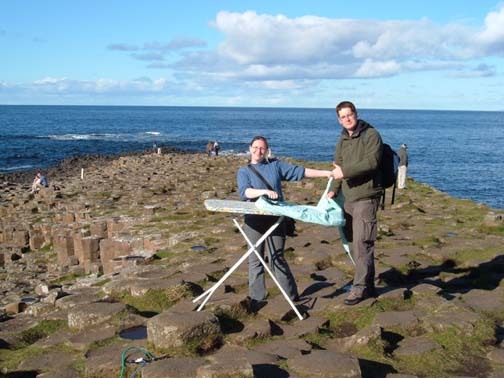 Elly ironing on the Giant’s Causeway! 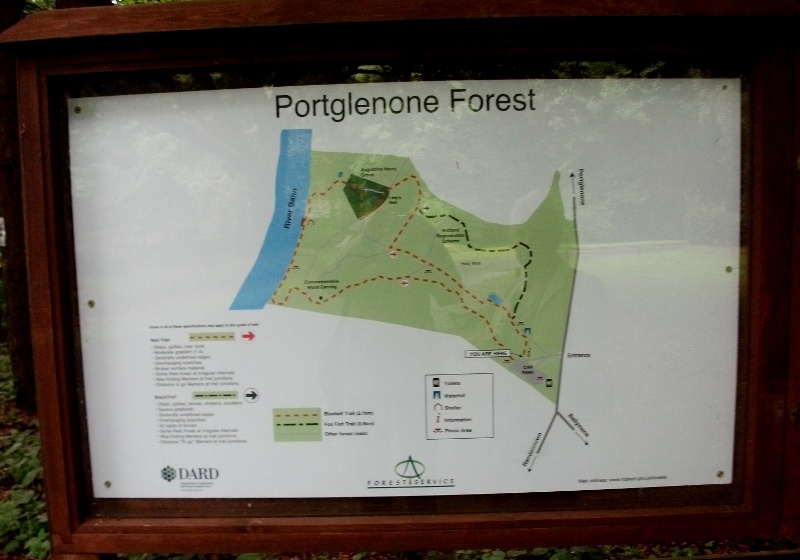 I had to go digging to find the photo and while there I reread the post that went along with it A Political Guide for Tourists to Ireland written four years ago. It applies even more so today, I think you might enjoy reading it. This entry was posted in Fun, humour, Ireland, Photography and tagged Fun, Giant's causeway, Humour, Ireland, Politics in Ireland, Travel on June 2, 2014 by Grannymar. Walking the streets with no rain! I had the honour of joining a walking tour of ‘Walking the Bridges of Dublin, hosted by one of my wonderful Toyboys, Anthony Mc Guinness. Anto and Dublin City Council are responsible for the Bridges of Dublin The website is all down to Anto and the time, energy, research and love for the subject in the project came through loud and clear during our tour on Saturday night. The River Liffey rises close to Kippure in the Wicklow mountains. 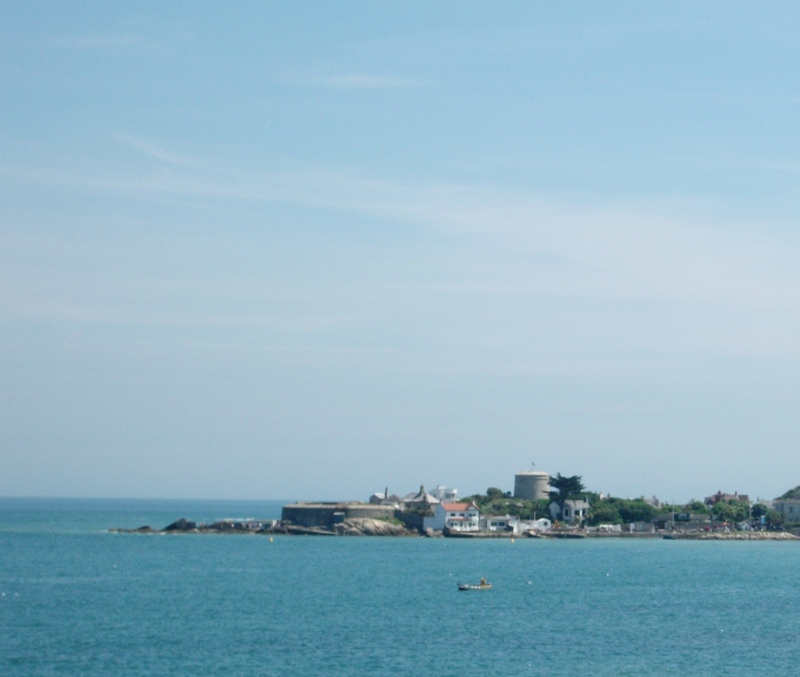 It flows for around 125 km (78 m) from source to sea through counties Wicklow, Kildare and Dublin before entering the Irish Sea at the midpoint of Dublin Bay. There are in total 24 bridges that cross the river. Our walk covered fifteen, with added information of those we did not see. We gathered at Rory O’More Bridge, often referred to as Watling Street Bridge. 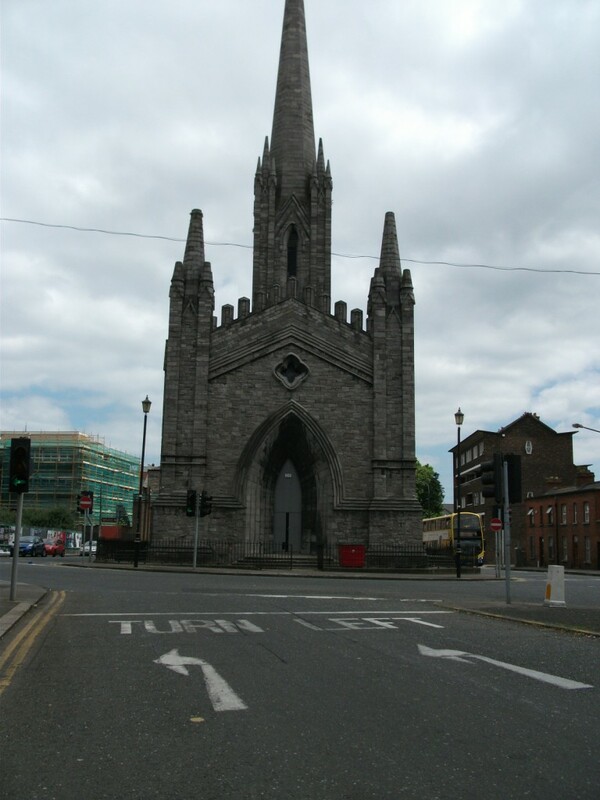 Building began in 1859 and it was declared open to the public in 1861 and crosses the River Liffey from Watling Street, on the south side to Ellis Street to the north side of the city. It is in fact the fourth, or possibly fifth, bridge at this location since records began. 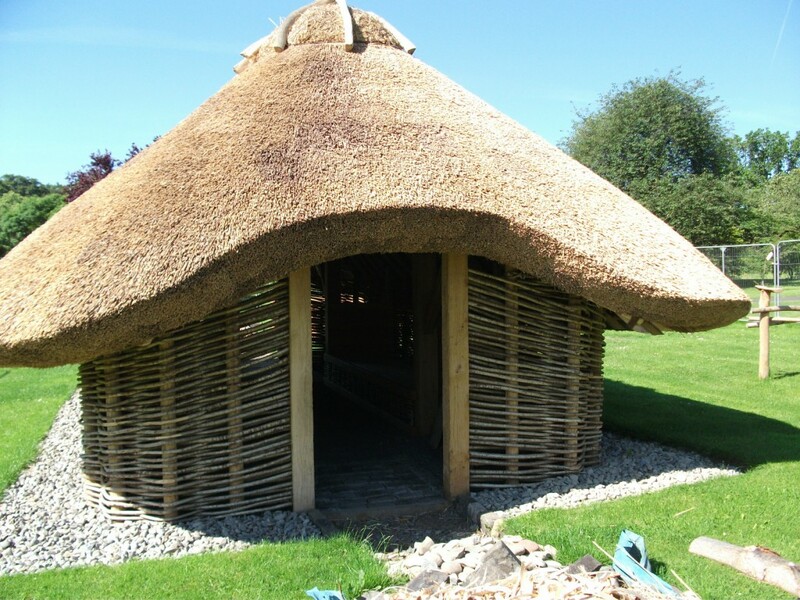 Dates of two of the previous structures: 1670 & 1704. When a bridge was first built on this site, it was a wooden structure, much needed by a growing city only served by a single bridge and it often in a state of dilapidation. 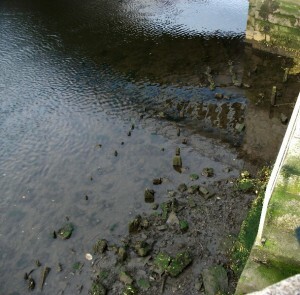 In the photo below you can actually see a line of wooden stumps from former wooden foundations. A single span bridge with a cast iron deck, built in St. Helen’s Foundry in Lancashire, England. The original, estimated price was 7,556 guineas, but rose to 11,000 guineas on completion. Can you imagine the large structure floating up the Liffey on a barge, before being lifted into place, by MANPOWER and not the modern machinery we have today. We continued our walk along the quays, stopping at each bridge to hear the story behind it and sometimes crossing over the bridge to take in some detail, find a space large enough to hold twenty of us without causing obstruction to passers-by or the moving motorised traffic. The journey from Watling Street to our final destination and watering hole was 5 km. O’Connell Bridge 1791 – dual carriage road bridge, a continuation of O’Connell St.
Rosie Hackett Bridge will be officially opened on 20 May 2014 – Road bridge. At this stage, the evening was cooling down the closer we came to the coastline, legs grew tired and Anto’s whistle needed wetting, so we adjourned to the Ferryman pub at Sir John Rogerson Quay. In days gone by the Liffey Ferry crossed the river at this point, transporting workers from North to South of the river to work in the Gasometer, the Banana Factory and Dublin’s ship building yard. As recently as the mid 1980’s Guinness boats carried barrels of their famous brew past The Ferryman. I thought I knew the city of my birth, having grown up in the days when I needed money for nylons or tights, I walked everywhere instead of waiting for buses that knew not a timetable. You know the story, no bus for an age and then three come together! Since I moved North thirty seven years ago, traffic has changed direction along the quays several times and five new bridges have been added with a sixth due to be unveiled tomorrow and open to motor traffic on Wednesday. 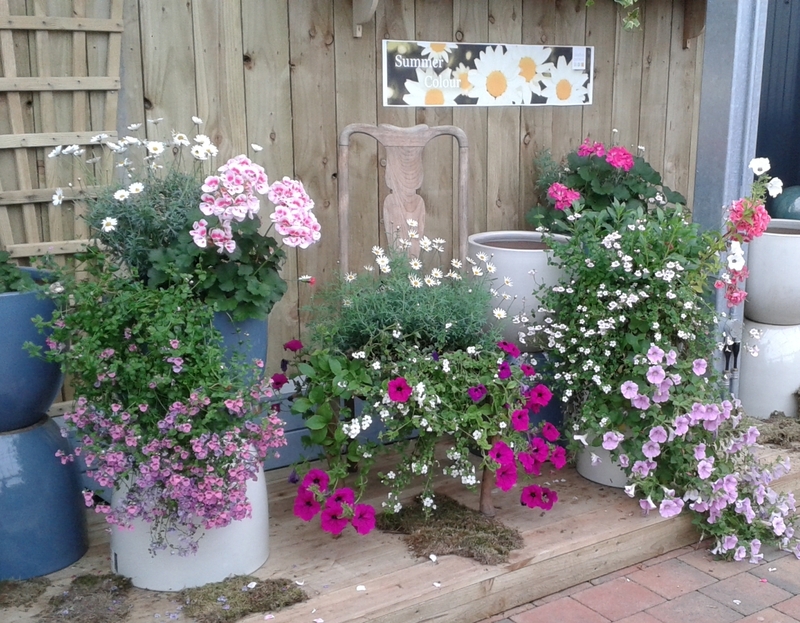 For more information, and professional photos please check out Anto’s website link above. 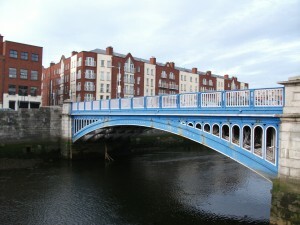 *1 Liffey Bridge is foot bridge. In the beginning there was a toll to reclaim some of the building cost, so it became know as the Ha’penny bridge and the name stuck. In Dublin, we like our nicknames! *2 Liffey Viaduct, a rail bridge with overhead power supply for the crescent shaped Dart electric train line along Dublin Bay. This entry was posted in A Tour of Ireland, Friends, Ireland, Photography and tagged Anthony Mc Guinness, Bridges of Dublin, Dublin City Council, Ferryman pub, The River Liffey, Walking the Bridges of Dublin on May 19, 2014 by Grannymar. with the odd gentle Moo! 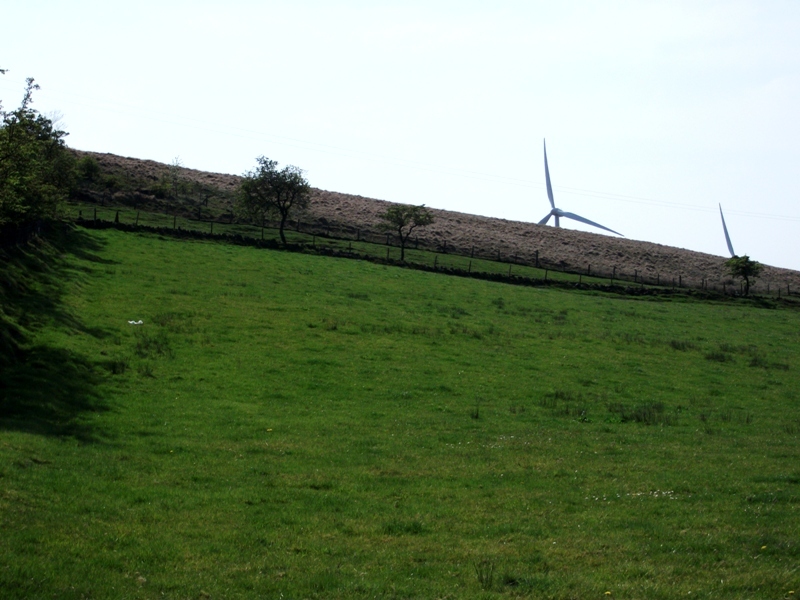 This entry was posted in Ireland, Photography, Travel and tagged country walk, county antrim, Ireland, quiet roads on April 22, 2014 by Grannymar. I only went out to buy a bag of peas. Honest! 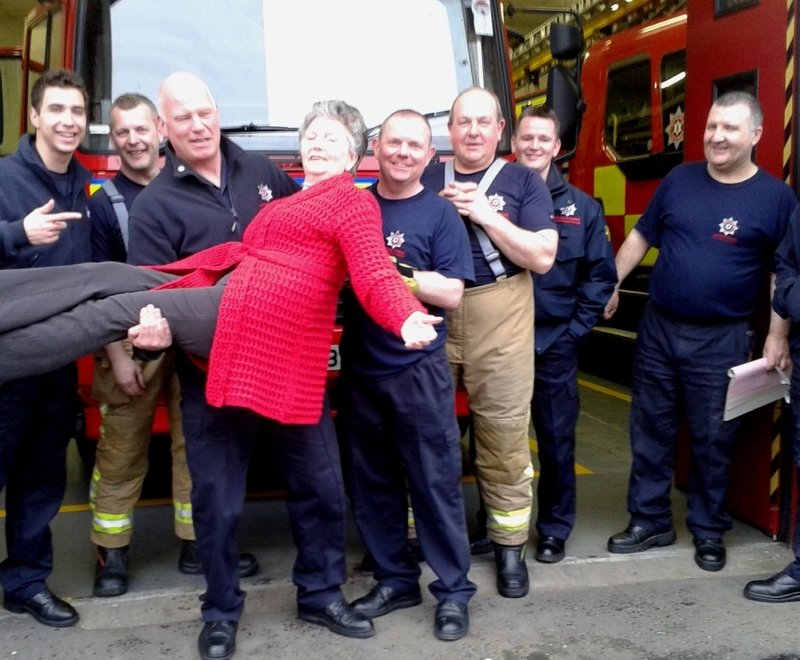 This entry was posted in Photography and tagged NI Fire & Rescue Service, Photography on April 2, 2014 by Grannymar. Maybe the sky is celebrating Ireland’s win of the Six Nations Rugby! This entry was posted in Photography and tagged Hope, Photography, sunsets on March 15, 2014 by Grannymar.